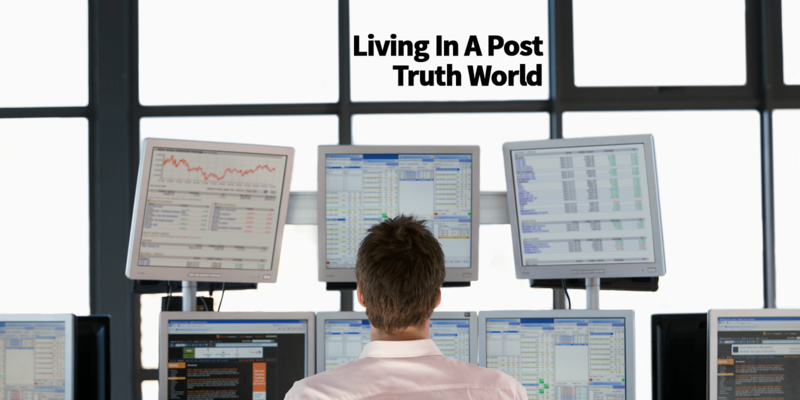 We now live in what commentators refer to as a “post-truth world”. It’s a time when facts and reality matter considerably less to people than their own opinions and beliefs. Originally, this started in the political realm but has seeped into day-to-day interactions that you have with people. In fact, this idea is so prevalent that “post-truth” was picked as the “word of the year” by the Oxford Dictionary people in 2016 and I can comfortably say that it became even more extreme in 2017. I could go into a long discussion about the role social media and the mainstream media plays in this, talk about how people formulate their own realities and spend most of their time looking to confirm their biases but the truth is, you probably know all of this so I’d be flogging a dead horse. What we all need to decide for ourselves is how far we want to delve into this quagmire. From a marketing perspective, this post-truth era is potentially the richest vein of gold that I’ve ever come across. When people are eschewing fact and reason and are actively ascribing their beliefs and opinions higher worth, the opportunity to “exploit” that is absolutely tremendous. Modern cults work on the same principles. You check your brain at the door, drink the kool-aid and believe whatever voodoo the leader tells you is right. Up is down, left is right… Doesn’t matter as long as you believe it to be true. Building cults in your online business can bring about crazy amounts of financial benefit. I’m going to veer off for a second into a bit of Robert Cialdini. In his follow up book, “Presuasion” he adds a seventh, “Kinship and Belonging” and this is a key element of building cults, but interestingly, it’s also a fundamental aspect of what’s going on in our “post-truth” world. People who believe in “alternative facts” seek out other people like them because deep down in their subconscious mind, they know that their opinion is probably wrong, but having other people support that view, shores it up for them and allows them to strengthen their resolve against their subconscious. And that same kinship is what cults provide people. More importantly, you can completely replicate that online. In fact, the quickness of people to eschew facts now in favour of their own opinion makes it even easier. Again, cults are big business. So, how do you start a cult? You don’t need to be a genius to see how the ever-increasing number of people who opt for opinion over fact leads easily to an increase in cult-like behaviour. And you shouldn’t need me to connect the dots for you on how this can be used for your benefit financially. I agree, it can be a very fine line – particularly the last point about the payoff. That veers into the Hopium Dealer thing that I really, really hate. When you tell people that better times are just around the corner if they keep the faith then you can never be wrong, you just haven’t had success “yet”. Take the Keto Community that I’m in on FB – that has cult-like qualities. People come into the group and talk about their doubts all the time, but the other members tell them that if they stick to that way of eating, are faithful to it and follow the process, they will lose weight. That’s actually true if they have weight to lose (some people just simply don’t) and that’s where the cult members reascerting the dogma are actually doing the other member a positive service in an ethical way. It’s a fine line you need to walk. Irrespectively, if you can build out your story and follow those steps above to establish your own cult, then this “post-truth” world we live in will make your audience very sticky.